Najah and Mahmoud are Syrian refugees. War has divided their family many times. “When the war started my husband said you must take our daughters to Kurdistan,” says Najah. “There was a dangerous Islamic group operating nearby and we were worried for the safety of our daughters”. Najah has ten children. She arrived in the UK with her three youngest – son Aiman (21), daughters Dilshin (16) and Sharifa (12), and her husband Mahmoud. She also has seven other grown-up children with families of their own. Like many Syrian refugees, they’re scattered across many different countries. The women walked for three hours before they finally found help. The Kurdish police picked them up and took them to a camp for Syrian refugees. “The people were very kind and looked after us,” Najah says. Mahmoud and Aimon later joined them in Kurdistan. 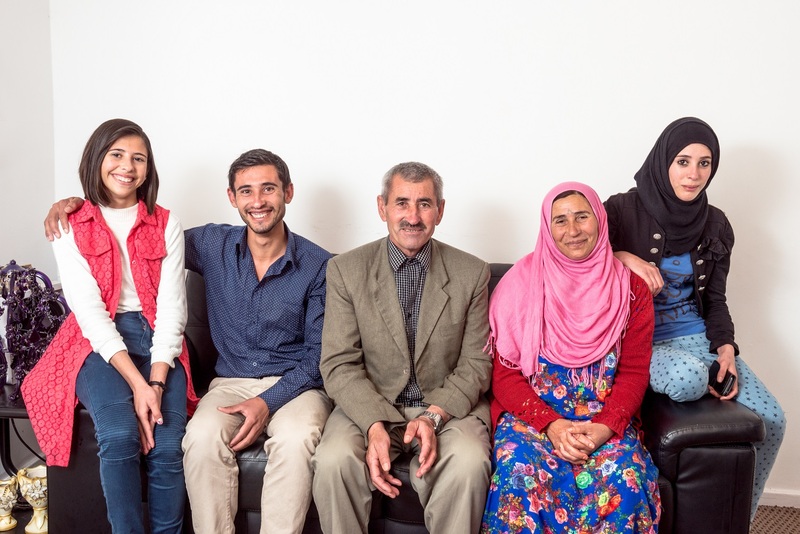 The family lived as refugees in Kurdistan for two years. Najah and Mahmoud both struggled with illness during this time. Like many Syrian refugees, they could not get proper medical care. Because of this, the family applied for refugee resettlement to the UK. Finally, they were accepted. They were overjoyed, but also sad because Najah’s grown-up daughter Newroz and her two young children could not come with them. They stayed behind in the camp. 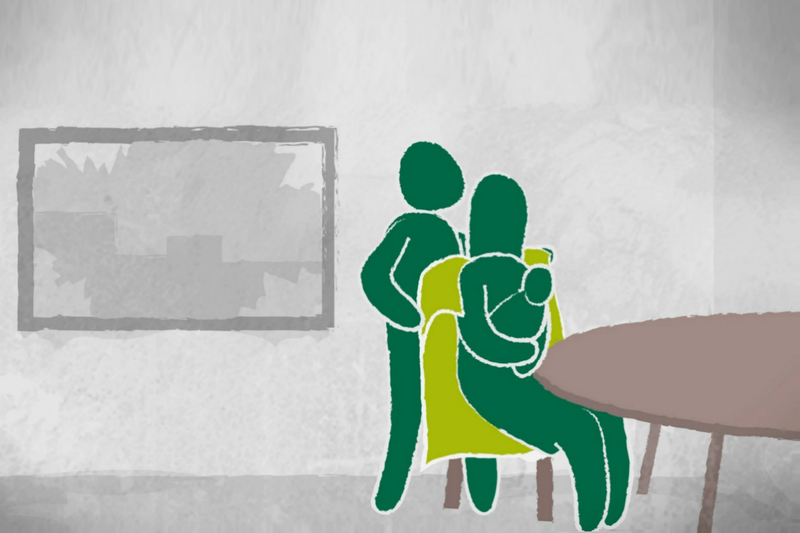 Since arriving in the UK, the family has worked hard to adjust to life in their new home. Their Refugee Action resettlement worker Dawn helped them settle in. “Dawn has been looking after us and doing everything to try to make our life easier here,” says Najah. Mahmoud agrees. “When we first arrived, Refugee Action took us to the doctor. My health is now much better”. “Life here is amazing,” says Najah. “We enjoy it very much. But our first problem is that we don’t speak English. When we know the language and can speak to people and deal with everything ourselves, we are sure our lives will be better”. Aimon, Dilshin and Sharifa are also working hard to learn English. Aimon was a mechanic back in Syria and can’t wait to start working to help his parents. His sisters are at school and college. “It’s a very nice country,” says Dilshin, “but we still miss home”. Sharifa feels the same. “It’s good. I’m making friends,” she says. Meanwhile, the family has been getting to know their British neighbours. Mahmoud has turned their neglected garden into an allotment, where he grows fruits and vegetables to share with other families on their street. “We had a big garden in Syria,” he says. “But the bombs hit it. It is all gone”. “I’m very sad to be separated from my children,” says Najah. “In Syria, we all lived in one place. We would see each other a lot. 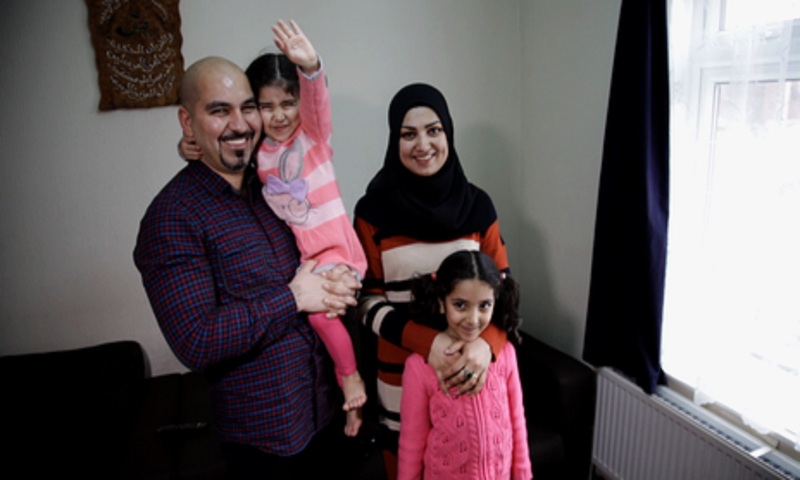 While they are afraid for their relatives in Syria, the family are looking forward to Christmas in the UK. “We’re hoping to celebrate with our English neighbours,” says Mahmoud. January marks a year since the family arrived in their new home. They’ve grown in confidence a lot since then. Mahmoud, Dilshin and Sharifa recently took the train for the first time and went on a day trip to London. Most of all, the family want to be with their relatives again. There is hope that their daughter Newroz and her children will be able to join them through refugee family reunion. “My greatest hope is for us all to be together again,” says Najah. You can help us to help more refugee families like the Addys. If you can, please make a donation today.